Hila over at Saturday Night Stitch rocked her BurdaStyle top during the holidays seen below in vibrant pink and pattern! 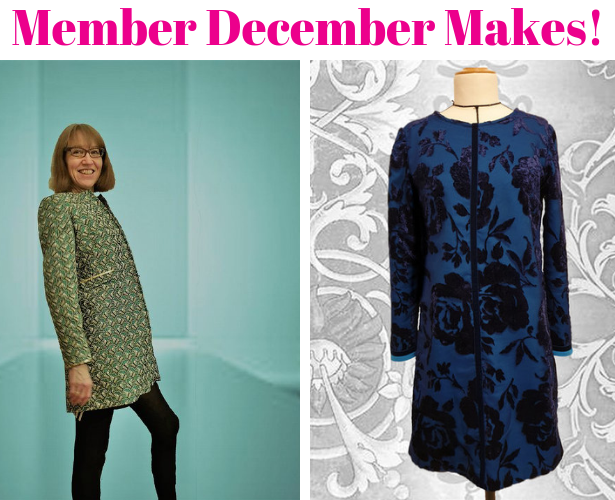 Member Anne-Berit made both a Coat for the Holidays and a Lace Dress! She really made both her own by adding ribbed cuffs to the dress, and redesigning the coat from a dress pattern. Bravo! Now Advanced Certified Teacher Evmorales showcased her course Floral Darted Blouse, let’s just say she passed with flying floral colors! 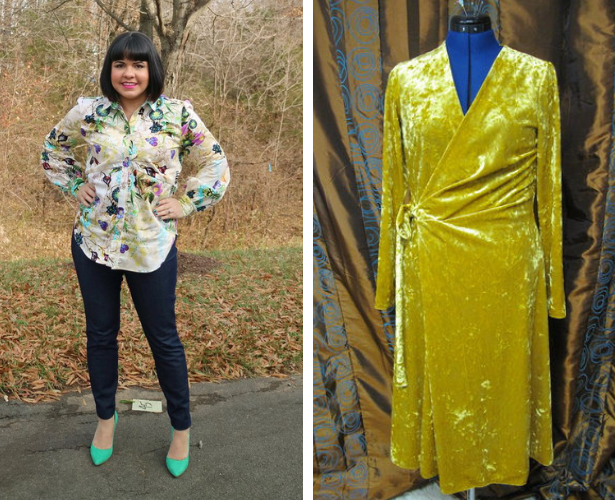 She also whipped up this gorgeous Crushed Velvet Wrap Dress which was her last #burdachallenge2018 projects – and wow, what a perfect golden end to 2018. 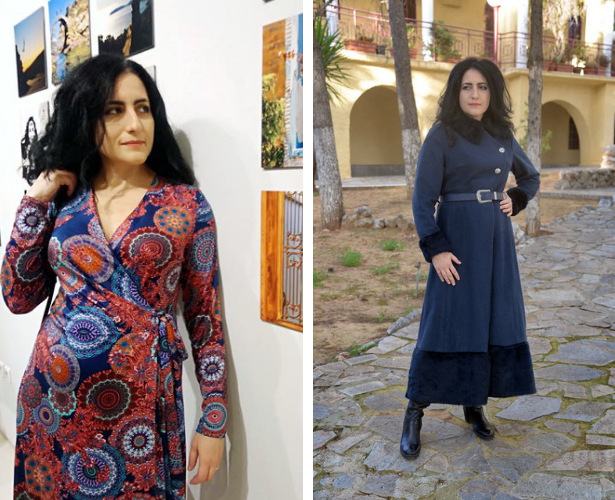 Power member and sewer Elpida Kyriakou sewed up both of these lovely looks including her Just a Wrap Dress – I mean, sometimes things are just what they are. Other than the glorious wrap dress she also made this Coat with wool fabric from the greek airforce, forgotten for decades in her aunt’s closet. So glad it had been brought to life! 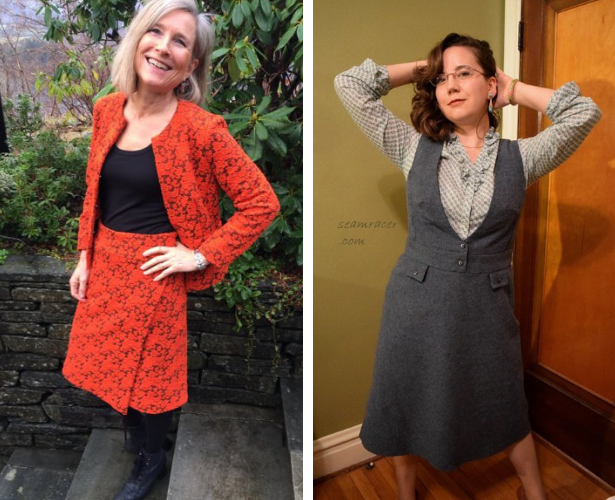 On the left we have Ellen Hatteland’s Crossover Skirt that matches her jacket, and then on the left member SeamRacer debuts her 70s Inspired Jumper – and I have to agree.. what a fun, cute, cozy, and versatile garment. So my plans were to make our Dress with Sheer Overlay as my Mash Up (LOVE how it turned out!) and a little vest using this pattern as a cozy accessory. 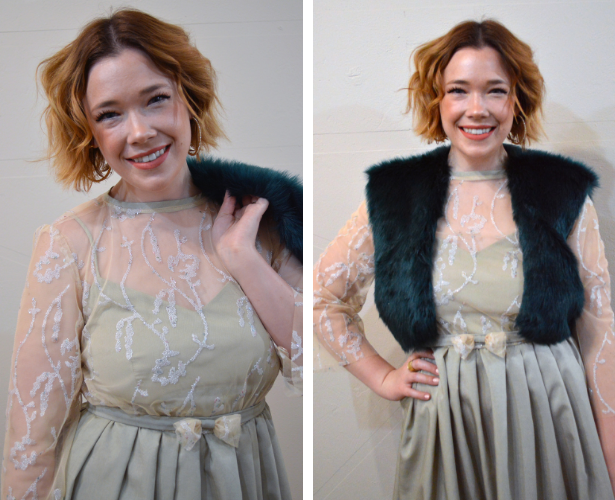 I didn’t intend to wear these pieces together, but once I finished my Shannon Fabrics fur vest, I thought the teal fur went nicely with my dress. 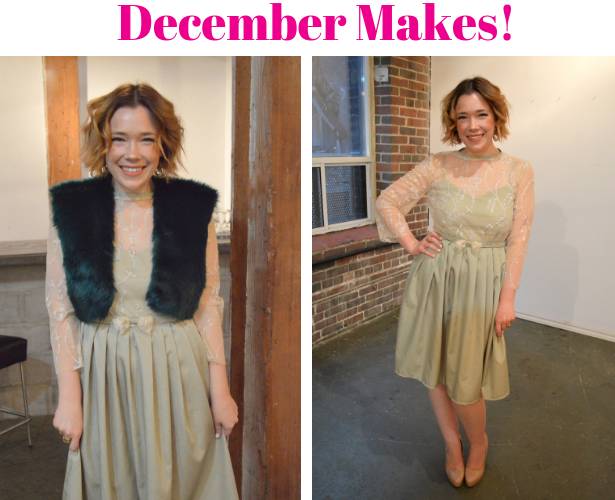 To see more images of my Mash Up dress, check out the reveal post here! I have been loving working with faux fur lately, just look at all these faux fur headbands I sewed up as holiday gifts. So I wanted to share some cutting tips! First, always cut 1 layer at a time – no cutting on fold or cut 2. For the vest the back pattern was cut on fold, so I simply used chalk to trace around my pattern edges on the back of the fur. Then to cut out I always use a sharpe knife like this one to cut the fur backing only. This vest was a really quick sew, as I didn’t even line it! The fabric had a knit backing so it wouldn’t fray, and the fur hairs covered the cut edges. Love it! Ok now onto January plans! 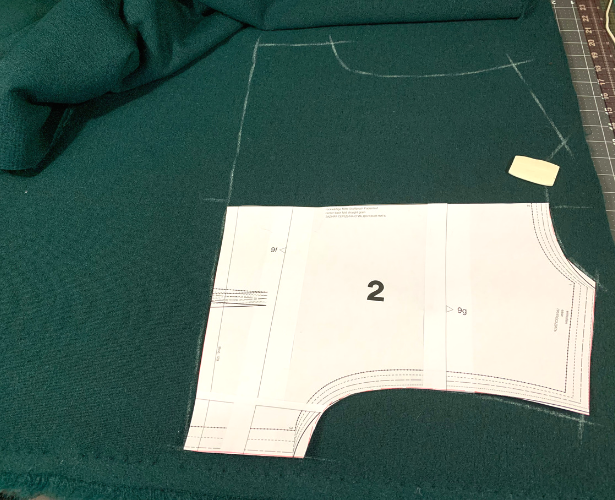 As I said in this episode of Sew & Tell, all my Mash Ups this year are going to work together to become a cohesive collection and I decided to start with a simple top. I’m using our Twist Shirt pattern from the 01/2019 issue as it is a simple sew and I have SO MUCH other sewing to get done in January. I’m filming a new sew-along at the end of the month (exciting) so most of my month will be dedicated to working on those samples. For my other project I want to make a tank. In looking through my closet I need more layering pieces, and I love this tank pattern also from the 01/2019 issue. P.s. Has anyone else been binge watching Tidying Up on Netflix?? I’m totally obsessed and currently in the process of going through me entire loft! Ok now for 2019… I reworked the free planner to be more of a project planner instead of a challenge. 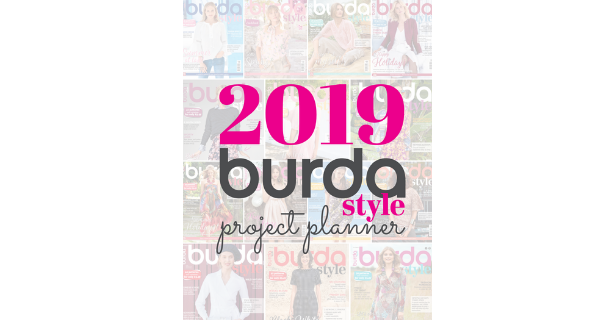 If you want to really challenge yourself you can do so, but if you just want somewhere to plan and share your BurdaStyle projects you can do that here with the planner. 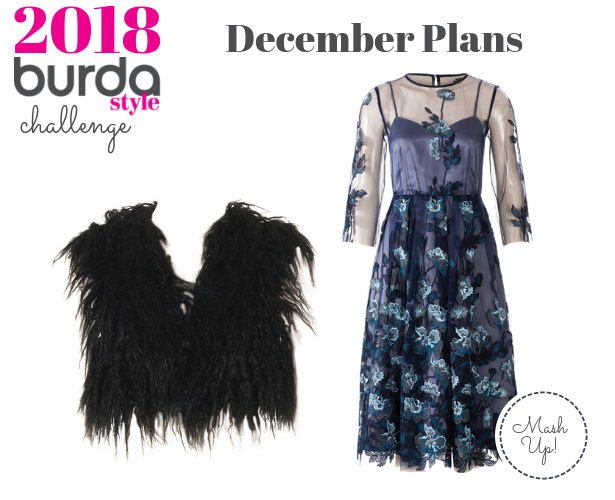 Thinking I’ll put together these posts monthly going forward in 2019, but I’m going to not only share “challenge” projects, and instead feature various projects that people sew and post to the projects page and generally on Instagram using various #burda tags. Nice work as always, ladies! Thank you so much Meg!! This year was amazing, so many projects, so much learned! Looking forward to 2019! I enjoy these Round up so much, always waiting to see what you are going to say about each one of us!